Thought about booking a Deuba vacation package? It's really easy with Expedia, and you'll be able to buy a few nice dinners or presents for your friends back home with the money you save. Not 100% sure about your booking? There is no cancellation fee from us if you change almost any reservation. It can be really nice to just wander the streets in a new destination, but sometimes it's a good idea to come up with a plan. Grab your schedule — we've got some wonderful ideas for your forthcoming Deuba vacation. Don your finest khakis and break out your best putter. If you're to itching to indulge in an afternoon on the fairways, secure a tee time at Pearl South Pacific Championship Golf Course. There's an excellent range of things to keep you busy close by. Wanting to impress your special someone? Take them for a stroll along the water's edge at Namatakula Beach. Still got some time to spare? Have a look at the excellent collection of interactive activities found at Arts Village. It's sure to be a fun and educational experience for the whole family! Haven't found somewhere to lay your head yet? 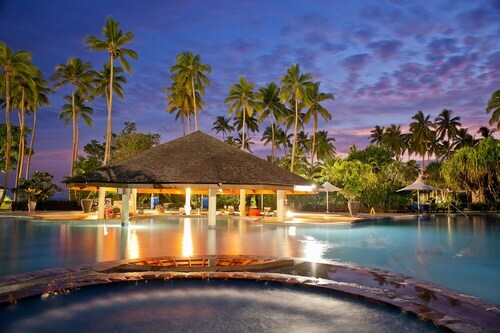 Deuba has just 3 properties, and the very best packages for luxury getaways and cheap vacations disappear quickly. Out top picks are the Waidroka Bay Resort (Korovisilou Town) and the Crusoe's Retreat (Man Friday Road). They've got terrific reviews and first-rate services and amenities. Check in and make your way through security, shuffle onboard, check your boarding pass for your allocated seat and get set for the flight! Your well-earned trip to Deuba is only a plane ride away. After the wheels touch the ground at Nadi International Airport (NAN), you'll be 45 miles (72 km) from the central area. Nestled on the beach, this Deuba resort is 0.1 mi (0.1 km) from Waidroka Bay Dock and 4.7 mi (7.6 km) from Vunanui Bay. Namatakula Beach and The Pearl Championship Golf & Country Club are also within 20 mi (32 km). 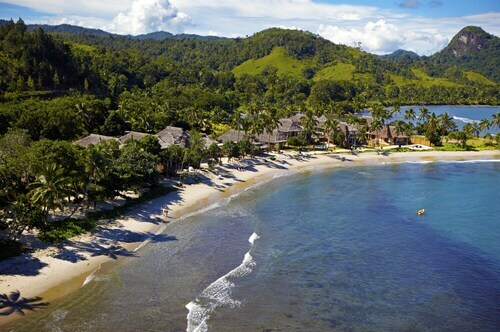 Nestled on the beach, this Korolevu resort is 5.3 mi (8.5 km) from Namatakula Beach and 12.3 mi (19.8 km) from Vunanui Bay. Sigatoka Sand Dunes and Waidroka Bay Dock are also within 25 mi (40 km). 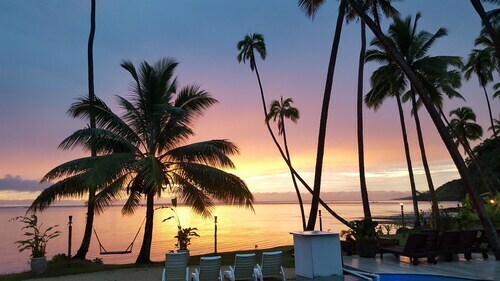 This family-friendly Korolevu resort is located on the waterfront, 9.2 mi (14.9 km) from Namatakula Beach, and within 20 mi (32 km) of Sigatoka Sand Dunes and Vunanui Bay. Tavuni Hill Fort and Lawaqa Park are also within 20 mi (32 km). 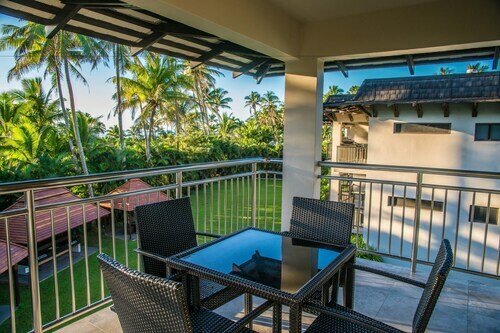 Nestled on the beach, this Pacific Harbour resort is within 1 mi (2 km) of Arts Village and The Pearl Championship Golf & Country Club. 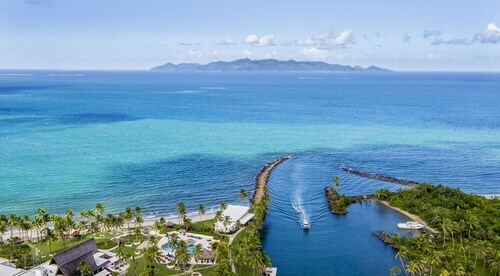 Zip Fiji is 16.9 mi (27.1 km) away. Nestled on the beach, this Korolevu resort is within 16 mi (25 km) of Namatakula Beach, Sigatoka Sand Dunes, and Lawaqa Park. Vunanui Bay and Tavuni Hill Fort are also within 20 mi (32 km). 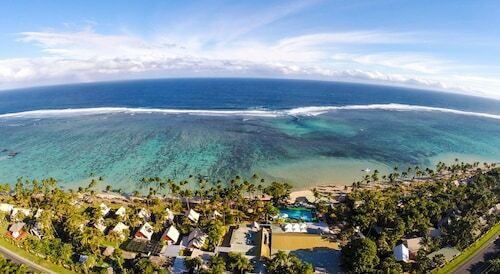 Nestled on the beach, this Namatakula resort is 0.1 mi (0.1 km) from Namatakula Beach and 8.3 mi (13.4 km) from Vunanui Bay. Waidroka Bay Dock and The Pearl Championship Golf & Country Club are also within 25 mi (40 km). Fri., 5 Jul. - Sat., 6 Jul.